A facet injection is a minimally invasive procedure that can temporarily relieve neck or back pain caused by inflamed facet joints. The cause of facet joint pain (arthritis, injury, degeneration) is not well understood and can be similar in nature to disc pain. The procedure has two purposes. First, it can be used as a diagnostic test to see if the pain is actually coming from your facet joints. Second, it can be used as a treatment to relieve inflammation and pain caused by various spine conditions. Carpal tunnel syndrome is a condition that causes pain and tingling in the hand and fingers. 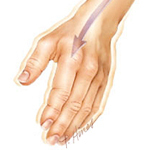 The median nerve passes or "tunnels" under a ligament (carpal ligament) in the wrist. 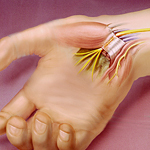 The nerve can become compressed and inflamed from repetitive movement of the hand and wrist. Carpal tunnel release involves making a skin incision in the wrist and cutting the ligament to relieve pressure on the nerve. Ulnar nerve syndrome is a condition that causes pain and tingling in the forearm and last two fingers of the hand. The ulnar nerve can be entrapped as it passes down the arm and behind the elbow where it lies in a bony groove. The ulnar nerve can also be trapped as it passes under ligaments in the wrist. Surgery involves making a skin incision at the elbow or wrist and releasing the nerve from the tissue and ligament. Trigeminal neuralgia is an inflammation of the trigeminal nerve causing extreme pain and muscle spasms in the face. Attacks of intense, electric shock-like facial pain can occur without warning or be triggered by touching specific areas of the face. Although the exact cause of trigeminal neuralgia is not fully understood, a blood vessel is often found compressing the nerve. Medication, injections, surgery, and radiation are used to treat the pain. Each treatment offers benefits, but each has limitations. The spine is made of 33 individual bony vertebrae stacked one on top of the other. This spinal column provides the main support for your body, allowing you to stand upright, bend, and twist, while protecting the spinal cord from injury. Strong bones and muscles, flexible tendons and ligaments, and sensitive nerves contribute to a healthy spine. Yet, any of these structures affected by strain, injury, or disease can cause pain. 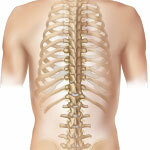 Back pain results when the spine is stressed by injury, poor posture, disease, wear and tear, or poor body mechanics. Acute low back pain is abrupt, intense pain that subsides after a period of days or weeks. It typically resolves with rest, exercise, and other self-care measures. Some people suffer from chronic pain that continues despite treatment. Sciatica is a term that describes leg pain, numbness, or tingling that radiates along the sciatic nerve. It starts in the low back and radiates into the buttock and down the back of your leg. 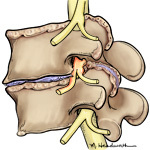 The pain is often caused by pressure on the nerve roots in the lower spine from disc herniation or stenosis. Acute sciatica typically resolves with rest, exercise, and other self-care measures. Some people suffer from chronic pain that continues despite treatment. Degenerative disc disease (spondylosis) is caused by the breakdown of your intervertebral discs. As you age, your spine begins to show signs of wear and tear as your discs dry out and shrink. These age-related changes can lead to arthritis, disc herniation, or spinal stenosis, which can put pressure on your spinal nerves and may cause pain. Physical therapy, self-care, pain medication, and spinal injections are used first to control the symptoms. Surgery is an option if the pain is chronic. 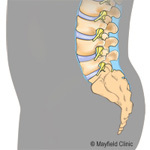 A herniated disc occurs when the gel-like center of a disc ruptures through a weak area in the tough outer wall. Neck or arm pain, numbness or tingling may result when the disc material touches or compresses a spinal nerve. Treatment with rest, pain medication, spinal injections, and physical therapy is the first step to recovery. Most people improve in 6 weeks and return to normal activity. If symptoms continue, surgery to remove a portion of the disc and any bone spurs may be recommended. 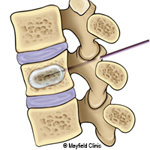 A herniated disc occurs when the gel-like center of a disc ruptures through a weak area in the tough outer wall. Back or leg pain, numbness or tingling may result when the disc material touches or compresses a spinal nerve. Treatment with rest, pain medication, spinal injections, and physical therapy is the first step to recovery. Most people improve in 6 weeks and return to normal activity. If symptoms continue, surgery to remove a portion of the disc and any bone spurs may be recommended. Spinal stenosis is the narrowing of the bony space (canals) through which the nerves and spinal cord pass. Arthritis can cause the facet joints and ligaments to enlarge and thicken restricting the space for the nerves to move freely. 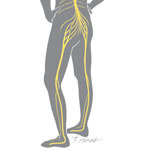 The pinched nerves become inflamed and cause pain, cramping, numbness or weakness in your legs, back, neck, or arms. Medications, physical therapy and spinal injections can help control the symptoms. 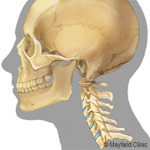 Chronic symptoms may require surgery to remove bone and open space for the nerves. Spondylolisthesis is a condition that affects the facet joints of the spine that help keep the vertebrae aligned one on top of the other. A weakness or stress fracture can occur between the facet joints. This weakness can cause the vertebrae to slip forward out of their normal position and “kink” the nerves. Treatments include physical therapy to strengthen the muscles surrounding the area. Sometimes a back brace is used. In severe slippage, surgery is used to realign the bones and then fuse them together. 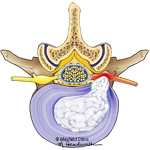 A synovial cyst is a sac of fluid that forms within the facet joint of lower spine. Facet joints affected with arthritis will often produce extra lubrication as a way of protecting the joint. 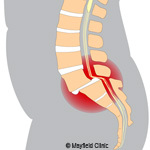 Sometimes, the fluid builds up and creates a bubble that protrudes into the spinal canal – a synovial cyst. 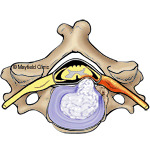 The sac creates pressure inside the canal causing symptoms similar to spinal stenosis. Medications, injections, and other conservative options such as physical therapy may help. If the pain is chronic, surgery to remove the cyst may be recommended. 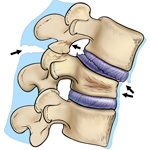 Vertebral compression fractures occur when the spinal bone collapses on one side producing a “wedged” vertebra. People with osteoporosis, tumors, and certain forms of cancer that weaken bone are prone to vertebral compression fractures. Lifting a heavy object, sneezing, or coughing may cause these fractures. Multiple fractures can cause loss of height and a hunchback. Symptoms include back pain and reduced physical activity. Pain medications, calcium supplements, physical therapy, and bracing can control symptoms. Early surgery may be recommended to lift the bone wedge and stabilize the fracture with injected bone cement. Anterior cervical discectomy and fusion (ACDF) is a surgery to remove a herniated or degenerative disc in the cervical (neck) spine. The incision is made in the front of the spine, through the throat area. 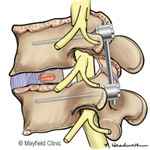 After the disc is removed, a bone graft is inserted to fuse together the vertebrae above and below the disc space. Your doctor may recommend a discectomy if physical therapy or medications fail to relieve your neck or arm pain caused by compressed spinal nerves. Patients go home the same day; recovery time takes 4 weeks. 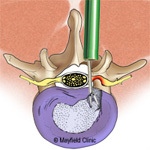 Microsurgical discectomy is a procedure to remove a herniated disc and bone spurs in the spine. A 1-inch incision is made into one side of your back. The muscles are gradually dilated with increasingly larger tubes to form a tunnel to the spine. 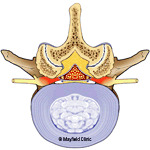 Through this tunnel, the ruptured portion of the disc is removed along with any bone spurs pinching the nerve. The entire disc is not removed. Your doctor may recommend a discectomy if physical therapy or medications fail to relieve your leg, arm or back pain. Patients go home the same day. 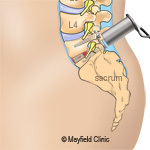 Spinal decompression (laminectomy) is a surgery to remove the bony overgrowth caused by spinal stenosis. The incision is made in the back of the spine. The arched portion of the bone (lamina) is removed to expose the spinal cord. Thickened ligaments and bone spurs are also removed. The overgrown facet joints may be trimmed to give more room for the spinal nerves. One lamina (single-level) or more (multi-level) may be removed. Decompression does not cure spinal stenosis nor eliminate arthritis; it only relieves some of the symptoms. 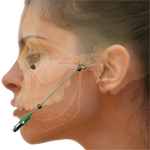 The surgery can be performed in an open or minimally invasive technique. 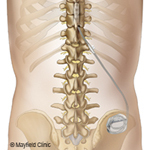 Spinal cord stimulation uses low voltage stimulation of the spinal nerves to block the feeling of pain. It helps you to better manage your pain and potentially decrease the amount of pain medication. It may be an option if you have long-term (chronic) leg, arm or back pain, and have not found relief through traditional methods. A small battery-powered generator implanted in the body transmits an electrical current to your spinal cord. The result is a tingling sensation instead of pain. 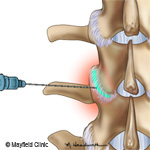 Intrathecal drug delivery, or “pain pump,” is a method of giving medication directly to your spinal cord. The system uses a small pump that is surgically placed under the skin of your abdomen and delivers medication through a catheter to the area around your spinal cord – similar to an epidural that women may have during childbirth. Because the medication is delivered directly to the spinal cord, your symptoms can be controlled with a much smaller dose than is needed with oral medication. 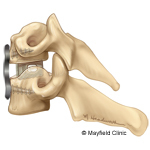 Transforaminal Lumbar Interbody Fusion (TLIF) is a minimally invasive surgery to permanently join together one or more bony vertebrae of the spine. A 1-inch incision is made in the lower back. The muscles are gradually dilated (widened) with increasingly larger tubes to form a tunnel to the spine. Through this tube, the damaged disc is removed and a bone graft is inserted into the empty disc space. Over time, new bone growth will fuse the two vertebrae together. The surgery is done without splitting the back muscles, takes 1 to 2 hours, and patients often go home the same day. 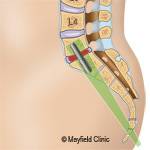 Axial lumbar interbody fusion (AxiaLIF) is a minimally invasive surgery used to fuse together the last bone in the lumbar spine (L5) and the first bone in sacrum (S1). 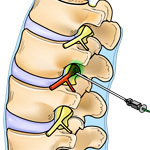 A 1-inch incision is made near the tailbone and a long, narrow tube is inserted to reach the spine. The disc is removed and a special rod (screw) is inserted. Over time, new bone growth will fuse the two vertebrae together. It is an option for patients who suffer from degenerative disc or spondylolisthesis. The surgery is done without splitting the back muscles, takes 1 to 2 hours, and patients often go home the same day. Spinal fusion is a surgical procedure performed to permanently join together one or more bony vertebrae. It will stop the motion in the painful area of your spine allowing you to return to a more normal lifestyle—though one that may not be totally pain-free. Because back pain responds well to physical therapy and exercise, make sure you have done your part toward a successful rehabilitation before considering surgery. What you do before and after surgery can help get you back on your feet sooner. It’s important to have realistic expectations and prepare properly for your recovery. 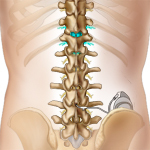 Lateral Lumbar Interbody Fusion (LLIF) is a minimally invasive surgery that approaches the disc space in the lower back from the patient’s side. 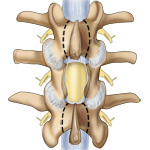 LLIF treats the region above L5-S1 in patients suffering from degenerative disc disease, spinal stenosis, recurrent disc herniation, and spinal instability. The surgeon makes one or two small incisions, one directly over the side of the waist, and the other close by and toward the back muscles. The disc is removed, and a cage packed with porous bone is inserted in the empty disc space and secured with pedicle screws and rods. The bone grows through the holes in the cages, fusing the two vertebrae together. Vertebroplasty and kyphoplasty are minimally invasive surgeries performed to treat vertebral compression fractures (VCF) of the spine. These fractures, which can be painful and limit mobility, are often caused by osteoporosis, spinal tumors, and injury. Traditional treatments of bed rest, pain medication, and braces are slow to relieve the pain. By injecting bone cement into the fractured bone and restoring the vertebra height, these procedures offer patients faster recovery and reduce the risk of future fractures in the treated bone.